Hey Oakland! You hear those air raid sirens? You’re not alone. They are happening because, well, there is one of two scenarios. 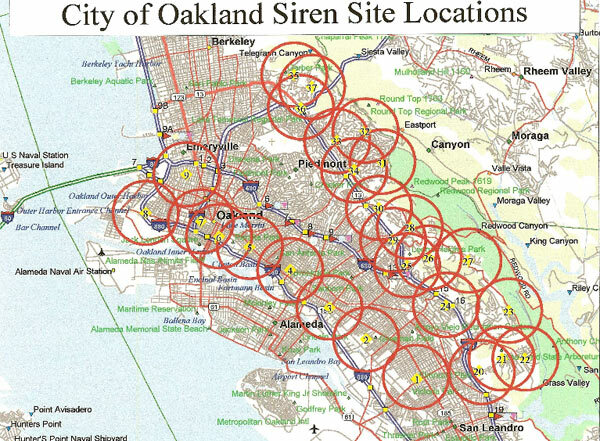 It is Wednesday at noon and you hear the air raid sirens because they do a test throughout Oakland every first Wednesday of the month at noon. Or reason two, something really bad is maybe happening and you should not be wasting your time online. Go tell your mother you love her or try to get laid one last time. If neither of those are an option, you can turn on your AM Radio and tune into an authoritative local news station such as KCBS, KGO, or Oakland’s own 530 AM Radio. If there is a real threat, you may have a better bet determining your next action by listening for local emergency services broadcast. If it is going down, let’s just hope you have a good survival kit. It’s safe to say that it is the first Wednesday of the month at noon and you are still here. This is a standard operating test that the City of Oakland does once a month to make sure the sirens work so that they may scare you to death if something ever really does happen. The idea of the sirens came about after the East Bay Fire Storm of 1991(1). They were implemented in a few locations in 2003 but have since expanded and even been upgraded recently. Here is the opriginal fact sheet from the launch. The sound range of the speakers is up to one mile from the tower. This is not Oaklands only early warning system though. They may send out emergency push notifications to phones like the Amber Alert does. You can even subscribe to text updates from the Oakland Police Department. I suggest it. Text your zip code to 888777 and you will get OPD Alerts. I recall the first time the sirens scared the crap out of me. Born and raised in Oakland, I just moved from the Dirty 30’s to over off East 14th and 6th Ave, new hood for me. The borders of FunkTown. But little did I know, at the end of my block in the park was a huge air raid siren tower(#5 on the map). It was a fine Wednesday at noon, as we have established, and of course, I was asleep on the couch. I woke up to a sound I had only ever heard in movies or video games. It was really loud, confusing, disorienting. This was long before smartphones so I was forced to fire up the old computer and start searching only to find, no answer. There was nothing online back them so I just assumed it was a test and carried on. 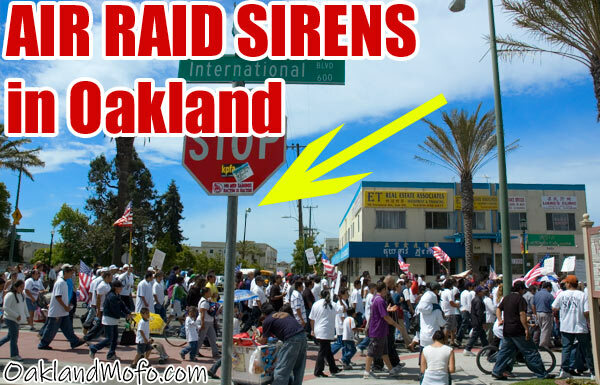 Here is a video I recorded out of my window with the air raid sirens going off in Oakland. I knew they were coming so I had my camera out and ready for this. A photo I took during the May Day Protest. You can see my air raid siren in the background. Get replies to your comment. Click to join the mailing list.